Lymphoedema means a build up of lymph fluid that causes swelling in a part of the body. It can develop if there are problems with the lymphatic system. Lymph fluid is in all body tissues. It comes from the tiny blood vessels into the body tissues. Usually, it drains back into the bloodstream through channels called lymph vessels. These are part of the lymphatic system. A build up of lymph fluid in an area of the body can happen if lymph drainage channels or lymph nodes are blocked, removed or damaged. This causes swelling called lymphoedema. In some people, lymphoedema can be due to cancer causing changes in the lymphatic system. In others, cancer treatments, such as surgery or radiotherapy to lymph nodes, can cause lymphoedema. It is a long-term (chronic) condition. It can’t be cured, but it can usually be well controlled. The lymphatic system is a system of drainage tubes and lymph nodes (also called lymph glands). It runs throughout the body. The tubes are called lymph vessels or lymphatic vessels. They start as tiny tubes in the body tissues and join up to form bigger lymph vessels in the chest and abdomen. Along the lymph vessels are small bean shaped lymph nodes. The ones you're most likely to know about are under your arm, in your neck and in your groin. You may be able to feel these. But there are also nodes in other areas including your chest, abdomen and pelvis. 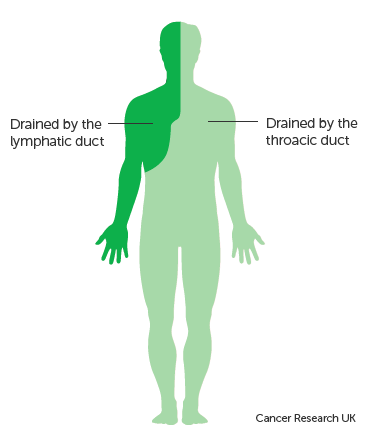 The lymphatic system carries clear watery fluid called lymph. The lymph drains out from the small blood vessels (capillaries) into the body tissues. It is a one-way drainage system. Proteins can also move out of the capillaries and the lymph carries them back to the bloodstream. It also drains waste and harmful substances away from body tissues. These include bacteria, viruses and bits of old cells. When muscles near the lymph vessels contract, they press on the lymph vessels. This helps to push the fluid through the lymph system. Some of the larger lymphatic vessels have valves so that the lymph can only flow one way. Lymph nodes filter the lymph. They also make and store white blood cells that circulate around the body. White blood cells help fight infections. These main ducts then drain into the large blood vessels in the neck, carrying the waste products from the body into the blood. The kidneys filter the blood and get rid of the waste products in the urine. Knowing how lymph drains helps us to understand how lymphoedema treatment works.